This story appears in the October issue of Hail Varsity. For more great stories like this subscribe today. Drew Brown remembers the BYU game in 2015 more than most. With the Huskers up 28-27 with just under a minute left, Brown was called on from 41 yards out to potentially ice things and put the Huskers up four. He stepped onto the field, collected himself, took a breath and fired. The Cougars took over from their own 35-yard line with 48 seconds left and no timeouts, drove it to midfield and connected on a Hail Mary as time expired. On the sideline, helpless, Brown was crushed. After the miss, Brown’s holder, Sam Foltz, tried to comfort him. Over the years, Brown has become a staple of the Huskers’ program, and his life has been shaped by the brother he has, the one he lost and the bonds he’s formed through heartbreak. Drew Brown (34) was 0-for-2 against BYU, just the second game in his career, and last to date, in which he missed more than one field goal. Drew Brown isn’t a superstitious person. Kickers like to have very specific routines they follow to the “T,” but he doesn’t have any of that. He doesn’t swap out a team-issued football cleat for a soccer boot on his dominant foot, and he doesn’t do anything crazy right before he runs onto the field. The only thing he does that could be considered part of a pregame ritual is shave. Every night, before gameday. Brown doesn’t even like the idea of superstition, the idea that one small detail gone awry could affect confidence. “Go with the flow,” he says, and that’s a mindset that has proven successful to this point. 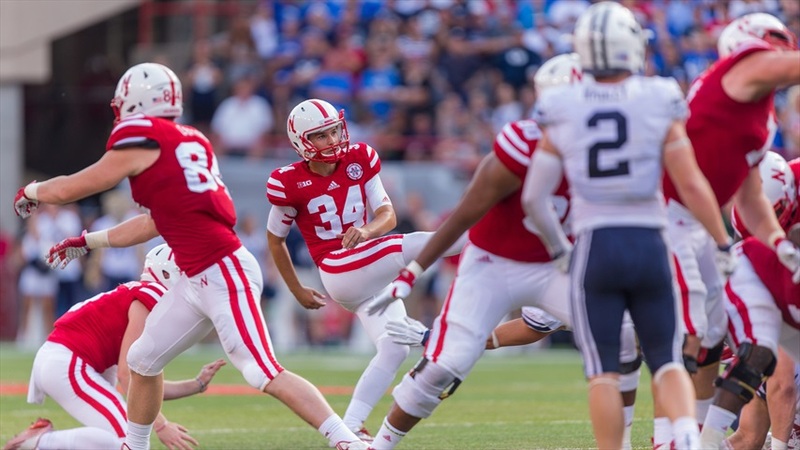 He currently sits just four field goals behind his brother, Kris, for second all-time on Nebraska’s kicking leaderboard. Alex Henery sits in first, 15 kicks ahead of Drew but still theoretically in reach. Drew is also fast approaching the all-time scoring record for the Huskers, a feat that would see him supplant his brother again. Kris taught Drew almost everything he knew about kicking. The 19-year age gap between the two (Drew is closer in age to Kris’ son now than he is to Kris) altered the brothers’ relationship a bit growing up, but not by much. When Kris joined the Houston Texans in 2002, he was a four-hour drive away from Southlake, Texas, where Drew grew up. Drew and his father, Hobert, and his younger brother, Reed, would drive to NRG Stadium to take in Kris’ games. Drew would go for the game – his father said he was that kid that never stopped with sports – but stay to marvel at his brother. After the games ended, Kris would bring Drew onto the field to work on kicking. He would let Drew come to Texans’ practices and stay late to show him how the pros did it. When he could, he’d show up in Southlake for Drew’s soccer matches and baseball games. Both brothers say soccer is where the kicking comes from. Their father was never allowed to play football, but he picked up soccer in his mid-20s and passed it down to his boys until they were physically mature enough to handle the sport. Kris said Drew was good at kicking from a young age, but baseball was where his talents were early. “If kicking weren’t his thing, I have no doubt that he could have played baseball in college,” Kris said. Before his sophomore year of high school, Drew made varsity as a kicker. “I think that was when it was a real opportunity for him,” Kris said. And Drew went after it. He said he felt football gave him a higher ceiling, a decision that was justified when Nebraska came calling. It still kills him to this day that he doesn’t play baseball anymore, but Drew’s career at Nebraska has proven he made the right choice. Now, with just a few kicks separating Drew from his brother’s legacy and the one he’s trying to build for himself, Drew says that he has yet to mention one word of the numbers and records with Kris. 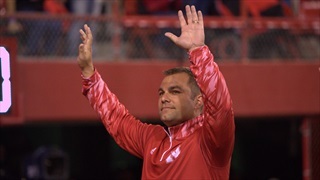 Former Husker kicker Kris Brown, Drew's brother, waves to the crowd during a ceremony honoring the 1997 team on Oct. 7, 2017 at Memorial Stadium. Drew wants to win, that’s what he cares about. He wants to earn a division title in his senior season and he wants to help Nebraska win its first Big Ten Championship. He wants to do right by his family name, but he says he draws motivation from someplace else – a sense of brotherhood like what he shares with Kris. Though the brothers talk almost every day, they hardly ever discuss the intricacies of kicking, Kris doesn’t feel like he has to. For that reason, Kris doesn’t like to bring unsolicited advice. If Drew has a problem he needs a second set of eyes to fix, Kris is there, but the brothers can talk about other things and they usually do. Since retiring from the NFL, Kris has moved to Omaha and Drew frequently visits him and his family on the weekends. They’ll hang out at Kris’ house or the two will go golfing together and be “as competitive as anyone on the course.” Kris comes down for every home game and even travels for the occasional road game, too. Sam Foltz is the other reason. 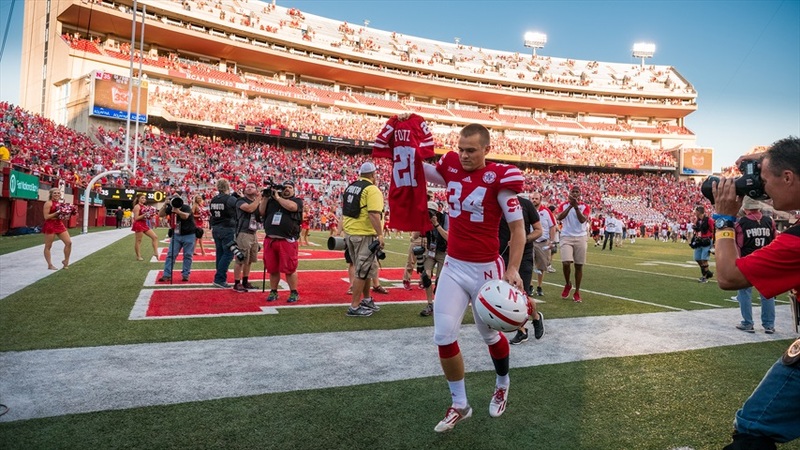 Drew Brown carries the jersey of Sam Foltz off the field at Memorial Stadium following the Huskers' win over Oregon in 2016. Drew Brown met Foltz on the first day of Nebraska’s summer conditioning in 2014. “He’s just one of those guys you don’t really come across very many types of in your life,” Drew said. “I knew that from day one. Foltz was country in every sense of the word. He grew up in a town in Greeley, Nebraska, that less than 1,000 people call home. He liked to refer to Drew as a “city boy,” and Foltz was universally loved by everyone on the team. Drew and Foltz became instant friends. Foltz was Drew’s holder on the field, constantly joking and teasing guys on the team, and off the field, he was Drew’s teacher. The night before each game, Drew and Foltz were together, unwinding and helping each other get their minds right. During the week, Foltz was upstairs in the Huskers’ residence hall almost every night studying or doing classwork. In May of 2016, once the team finished up summer practices and classes ended, Drew grabbed Foltz and the two took a road trip back to Southlake for Foltz to meet Drew’s parents and spend a week with his family. While they were there, Drew showed Foltz the works. They took in a Rangers game together and toured the Cowboys’ home at AT&T Stadium. Drew showed off his old high school and his parents made sure to feed them well. Hobert fondly remembers a chicken fried steak meal and a few Mexican dinners they had. They also went to the Kennedy Museum in downtown Dallas and Foltz made a strong impression on Hobert. That was the only time Drew’s parents got to spend with Foltz, but Hobert knew his son had found someone special in Lincoln. He said you could tell just by looking at the two the kind of relationship they had. Drew doesn’t like to talk about the “deep stuff,” Hobert says, but he knew Drew thought the world of Foltz. It’s what made his passing so hard. The story has been well-documented by now: Kohl’s Kicking Camp in Wales, Wisconsin, the night out with friends, Foltz telling Drew that he was driving back to the house where they were staying and Drew was going back in a separate car – the only time the two were apart the entire trip – and Drew getting back to the house to find Foltz wasn’t there. Drew waited until unanswered phone calls and 20 minutes of anxiousness prompted him to go looking for Foltz. It was pouring down rain and it was dark, but when Drew came to a clearing and saw flashing red and blue lights, his heart sank. “I started crying,” he said. The cover of the October 2017 issue of Hail Varsity. Hobert remembers getting a call from Drew around 1:45 a.m. that night telling them what had happened and asking them what he needed to do. Hobert told Drew he needed to call Foltz’s parents and head coach Mike Riley and tell them what happened. Drew knew there had been an accident, and he was the one to tell Gerald and Jill Foltz, but he didn’t learn until the next morning that Sam had passed away. Drew gathered up Sam’s belongings to bring them home that Sunday. Hobert met him in Kansas City and drove him back to Lincoln where he met with the rest of the team and shared the news. 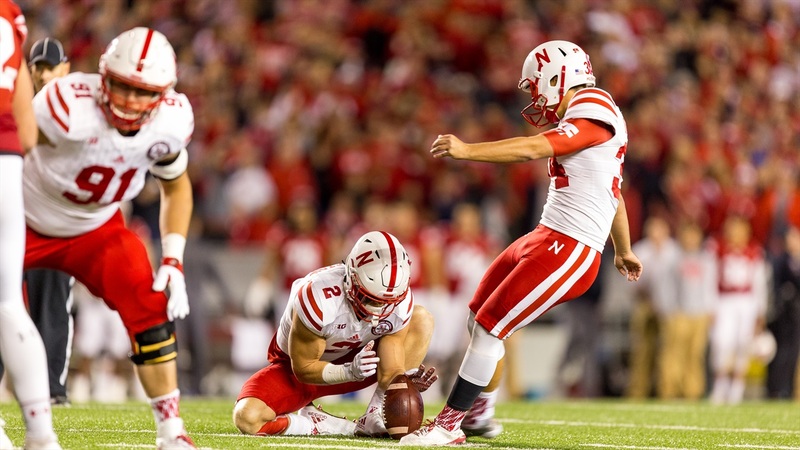 While the Huskers prepared for the upcoming season, Drew – along with Riley, backup kicker Spencer Lindsay, quarterback Zack Darlington and a few other players – began talking about how to honor Sam. The idea of sending out 10 men without a punter on the team’s first punt of the year was tossed around and the more they thought about it, the more it began to stick. “It ended up being a pretty cool moment for not only us but college football in general,” Drew said. 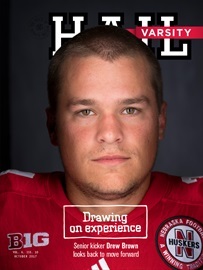 As the season got closer, the support from Husker Nation and the rest of the college football world was overwhelming, and it helped Drew deal with some of his grief. Since that time, Drew has grown close with Sam’s parents, Gerald and Jill. He said their relationship was close before, but it’s only grown stronger over the last year. When a game would end, Sam used to find Gerald in the crowd and they would hug. Drew has since taken up that role. They meet before the game and talk and hug and laugh, and they exchange text messages later that night. Drew considers them a second set of parents. Before his senior season began in August, he shared his motivation for this season: kicking for them and kicking for Sam. “Every single kick that I have, [Sam] wasn’t able to have,” he said. Kicker Drew Brown (34) and holder Zack Darlington (2). There’s been a change in Drew since Sam’s death, one that Darlington, Drew’s freshman roommate and now one of his closest friends, has noticed profoundly. Drew has taken punter Caleb Lightbourn under his wing over the past year, doing for Lightbourn what Sam did for him. Lightbourn looks up to Drew’s “calm, cool and collected” attitude and said Drew has helped him with the mental side of things. When they went back to Wisconsin this past summer to attend the kicking camp again, Lightbourn and Drew spent almost the entire camp together. On a Thursday night when they were driving back to the house where they were staying, there was a huge rain storm. “We were driving in what seemed like the same type of weather Sam was driving in and it was really just a whole lot of emotions just running through your head,” Lightbourn said. Drew kept everyone calm, including himself. It had been almost a year since Sam’s death, but Drew had felt him here and there since. There might not have been a more poignant moment than that night, though. “We knew that it was kind of like Sam was there at that moment,” Lightbourn said. A year or two ago, Drew might have acted differently. He might not have become a leader on the team. He might not have taken Lightbourn under his arm and helped him navigate the same things Sam once helped him through. “I think he definitely grew a little bit as a person,” Darlington said. “After Sam passed away, I think he definitely had a different look on life and I think that he was a lot more . . . not that he was not outgoing, but he definitely seemed to want to just take the time to talk about the little things. Since then, Darlington says his relationship with Drew has never been better. “I thought we were close then, but we’re even closer now,” he said. When he’s not with Kris or working on football or schoolwork, Drew is hanging out with Darlington. They play Grand Theft Auto together and compete to see who can get the highest police rating or go on the longest cop chase. They play Madden too, yet, oddly enough, never against each other. Instead, Darlington said they always team up and take turns running go routes and playing pitch-and-catch against helpless defenses. Darlington said Drew once racked up 700 yards passing in a single game and he’s hesitant to go against him one-on-one. They’re both content playing together, mostly with the Carolina Panthers. Darlington, just like everyone else on the team, was close with Sam. When the 2016 season drew closer and the Huskers needed to decide on who would be Drew’s holder, there wasn’t really any other choice. Whenever Sam was out of town or off doing something else, Darlington was Drew’s guy. He knew Darlington had done it before, and should be the one to do it again. Last season, Drew missed two kicks. He was a perfect 38-for-38 on PATs and 12-of-14 on field goal tries. When he missed, Darlington tried to think of what he had done wrong. Maybe he had the laces back or just put the ball down wrong. 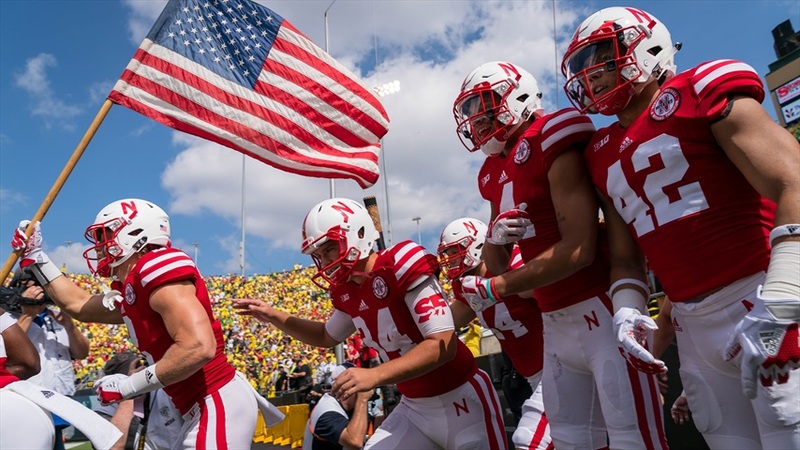 Zack Darlington carried the flag with kicker Drew Brown (34) right behind him as the Huskers took the field to face Oregon in 2017. Zack Darlington isn’t the only one that sees a change in Drew. It’s evident to everyone that is close to him. Riley sees it. Lightbourn sees it. His dad sees it and Kris sees it. Coming out of his shell, as Kris puts it. Drew’s living life now. This past May, Hobert met Drew down in Phoenix, Arizona, for a golfing trip. They played four rounds and Drew won three, but Hobert got him on one of them. He had undergone hip surgery just two months before, but the trip had been planned in advance and Hobert wanted to spend time with his son. He could sense, though, that something was different. He didn’t need to ask what had changed. He knew. You’ve got to look back on the bad memories to create new ones.